Simply removing the ice off the surface of Antarctica would reveal an archipelago with most of the western half of Antarctica under water. But factoring sea level rise from the ice melt and isostatic rebound (from the removal of the ice sheets), East Antarctica would form a continent while West Antarctica would remain an archipelago. The "chlorine" smell you smell around pools is not actually chlorine gas but chloramines (chlorine/nitrate derivatives) produced by nitrogen containing contaminants reacting with the chlorine in the pool. These contaminants are often from swimmer wastes such as sweat, body oils and urine. This is why many pools ask you to have a shower before you swim. The chloramines can still act as disinfectants but they're 40 times less powerful than chlorine or hypochlorites. Still want to go swimming in your local pool? Unless you are a saiyan, whatever doesn't kill you most certainly will not make you stronger. In fact you will become weak, like Krillin. Or Raditz. Squirrels are not phased by squirrel proof feeders. Some deer occasionally will eat baby birds. Flemish Giant rabbits will often grow to 10kg (22lb) or more. One of them, named Darius weighs 22.6kg (50lb) and is 4'3" long!!! The use of the rabbit's foot as an amulet to bring good luck probably originated from the Celtic people since 600 BC. This belief is not limited to Europeans as some groups of people from China, Africa and the Americas had similar superstitions. In many cultures foxes are considered to be familiars and are associated with evil and trickery. In Aztec mythology there are 400 rabbit gods. they also called their highest level of intoxication "Drunk as 400 rabbits"
Foxes have very strong body odour. Rabbits are popular prey and spent most of their day hidden in vegetation or in underground burrows. Or on the HP! forums. The scientific name for the fox is Vulpis vulpis. Only those species within the genus Vulpis are considered to be true foxes. Unlike foxes, rabbtis almost never carry rabies and they are not known to transmit it to humans. Foxes are driving other species to extinction in Australia and as such there are fox eradication efforts underway, especially in Tasmania where they were only recently introduced. This is an episode of Australian kids TV show "Round The Twist". 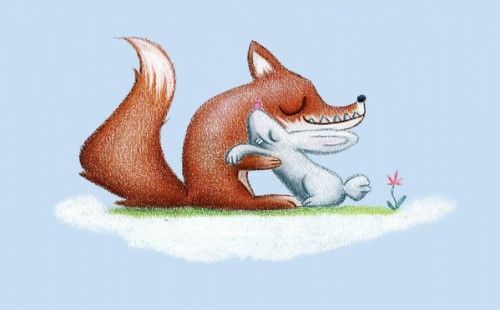 That particular episode is about a fox and is based on a story by Australian author Paul Jennings called "Grandad's Gifts" in the book "Unbearable!". Actually serence, that was a hare. And it was a tortoise he lost to, not a turtle. It was Aesop's fable about the tortoise and the hare. A group of foxes is called a skulk. a fox den is called an earth. A male rabbit is a buck and a female rabbit is a doe. Does usually do all the digging as they like to make burrows in which to have/raise their kittens. Bucks will occasionally dig a shallow "scrape" but they won't do much more than that. Fox hunting (in the traditional style) was outlawed in the UK in 2005. From the look on that foxes face, it won't be a cute picture for much longer. I suggest you look away now. In The Animals of Farthing Wood (the TV show which was adapted from the book) Fox takes an oath not to swallow or otherwise consume anyone. when you look at the Bucks bunny cartoon from a tiny different point of view , the bad guy isn't the hunter , but Bugs himself , and he's not the only rabbit/hare who's been depicted as the "hidden bad guy"
Wait... You promised not to eat me? Yay! I have never heard of the Bucks Bunny cartoon.